Members of the Pan-Amazonian Ecclesial Network. Photo by Conferencia Episcopal Venezolana. The president of the Pan-Amazonian Ecclesial Network, Mgr. 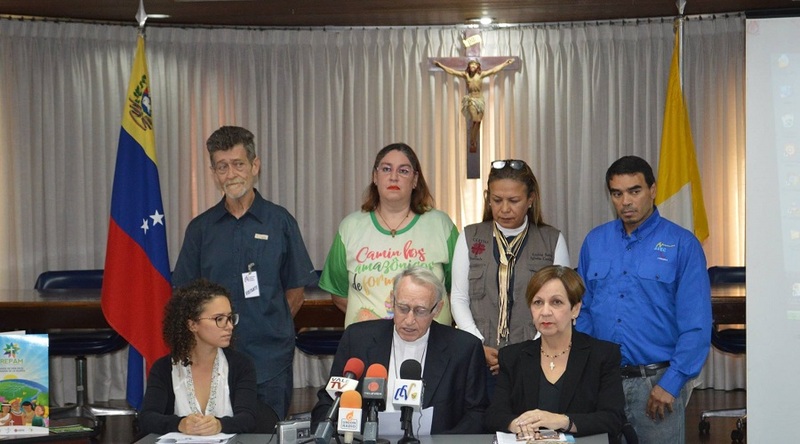 José Ángel Divasson, hosted a press conference today where he presented the Catholic Church’s position regarding the exploitation of mineral resources in Venezuela’s southeastern Guayana region. Divasson, who also is the vicar apostolic of the Amazonian town of Puerto Ayacucho, said that not only the church but the entire world is worried about the environmental degradation that unregulated mining activities are causing in the Bolívar and Amazonas states. He also said that the survival of Indigenous communities is at risk. The two provinces host the so-called Mining Arc of the Orinoco River National Development Strategic Zone, a 111,843 Sq.Km concession area (12.2% of the country’s landmass) for mining gold, diamond, iron ore, copper, bauxite, coltan, among other resources. The creation of the Arc has been controversial since it was announced in 2016. At today’s event, the priest was joined by another member of the Pan-Amazonian Ecclesial Network, Héctor Escandel, who said that Venezuela is moving towards a ‘predator development model’ in which economic measures are aimed at extracting resources in an uncontrolled fashion just for the sake of accumulating riches for the rich. According to Escandel, such a model creates more poverty and exclusion and must be annihilated. Spokespeople for environmental and human rights organizations who were also at the press event got hold of the microphone and denounced that Indigenous peoples living in areas where mineral extraction is happening have been victims of reiterated human rights violations and that authorities, instead of helping them, turn the blind eye or retaliate. “Beyond utopian speeches, the granting of new concessions and the growing presence of both individuals and entire groups that operate illegally have expanded the areas where mining is taking place. In many cases, this is done by destroying the natural environment,” said Maria Elena Febres, president of Venezuela’s National Council of the Laity. Febres added that official communications that present projects at the Mining Arc as the solution to the national problems have not been accompanied by performance reports. Venezuela is undergoing a severe economic crisis. GDP has fallen by 40% in the past three years, annual inflation has reached 6,147% and eight in 10 people live in chronic or severe poverty. This situation drives many to work illegally in the mines at whatever cost.